Filipinos are taking over the online shopping scene in Asia! According to an online consumption study conducted by Nielsen, Filipinos are among Asia-Pacific’s most active online shoppers. That’s not all there is to know about online shopping in the Philippines. Filipinos are reportedly the savviest at filling up their virtual shopping carts, as 72% of Filipinos use the Internet for product research – bagging the title of being the most active bargain-seekers in Asia, what with the exponentially increasing Internet penetration in the country. 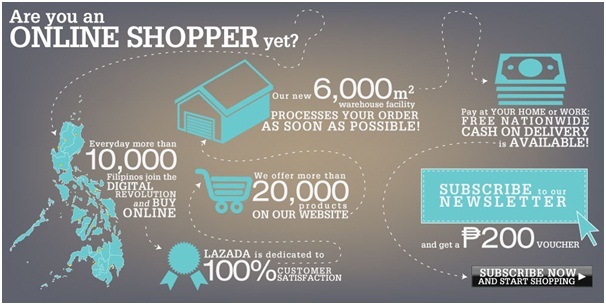 Lazada, the #1 e-commerce site in the Philippines is geared to handle the demand for making products easily available. It recently acquired a 6000-square-meter warehouse facility that processes orders as efficiently as possible. With more than 20,000 products on its website, Lazada.com.ph is the ultimate digital shopping destination, where shoppers can avoid long lines, heavy traffic, and cumbersome product handling. For added convenience, Lazada even offers free shipping and next-day-delivery for Metro Manila orders, as well as multiple payment options such as Cash on Delivery, PayPal, credit card, ATM transfers via Megalink, and BDO installment plans at up to 24 months. Not only that but attractive deals, promos, and regular flash sales pique the interest of Filipino shoppers online, appealing to the “bargain-hunter” mindset. Are you part of the digital revolution and exercising your right to shop? Here’s another savvy deal for you: just sign up on the mailing list and get a PhP 200 voucher to use on your next Lazada purchase! For more information on discounts, promotions, and updates, visit www.lazada.com.ph, subscribe to our newsletter, like us on Facebook (http://www.facebook.com/LazadaPH), and add us on twitter @lazadaph.